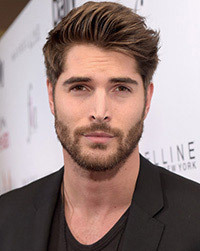 Nick Bateman was born in Burlington, Ontario, Canada, on November 18, 1986, is an Canadian male model and actor. He began his modeling career at the age of twenty. Nick is best known for his massive social media presence, he has more than 7 million followers on his Instagram account. He started practicing karate at the age of 4 and has won 4 Martial Arts World Titles. He started dating Maria Corrigan in 2008, they have one son. He made his big screen debut in Canadian black comedy action film Hobo with a Shotgun (2011) in role as Ivan / Rip. Rogue, Vulkan, W Magazine, Hello, VC Magazine, Prestige Runway, LA Style, UMM Magazine, L'Officiel Hommes Ukraine, Adon. Dsquared, Fila, Jockey, Abercrombie & Fitch, Calvin Klein, OP Swimwear’s “Summer Days” campaign with model Hannah Davis. Walked runway for Rudsak, Ed Hardy, HD Homme, DALLA. Represented by agencies Wilhelmina Models Miami, Elmer Olsen Toronto and Premier Models London. I make sure I post everyday so people get an inside view on my life, whether I’m working, hanging at home with my dog, or traveling, I’d always try to post something so that people knew what’s going on in my life. As long as I’m happy doing what I’m doing, that’s what I want to do. I’ll never be one thing. I want to be happy. If I wake up, and I am happy doing what I am doing, that is all that really matters to me in accomplishing my goals. Even when I was modeling, I didn’t like to consider myself just a model. I was always an athlete and a martial artist, who became a model, for the fun of modeling. Right now I’m considering myself more of an actor, because that’s where I wanna go with my life. Just post your life! Don’t worry about people thinking you’re narcissistic by posting so many selfies, because people are gonna think what they’re gonna think.